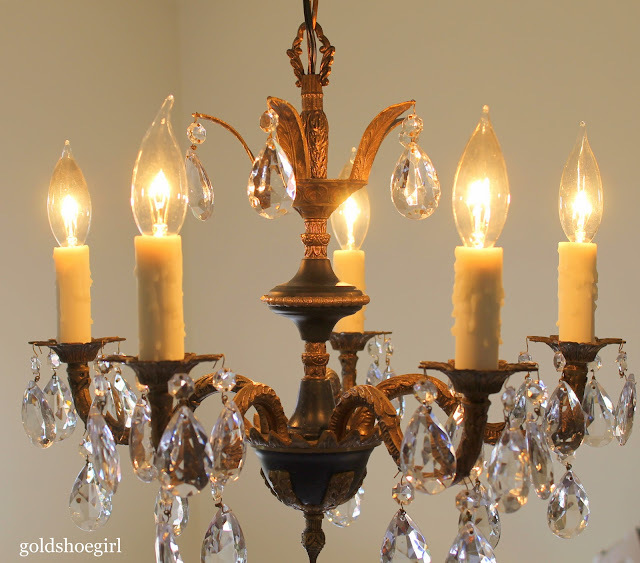 A few weeks ago I told you about the chandelier we hung in the dining room. You can read more about it here. While it was looking so much better than the old gold one I couldn't help but feel that it was not exactly how I wanted it. 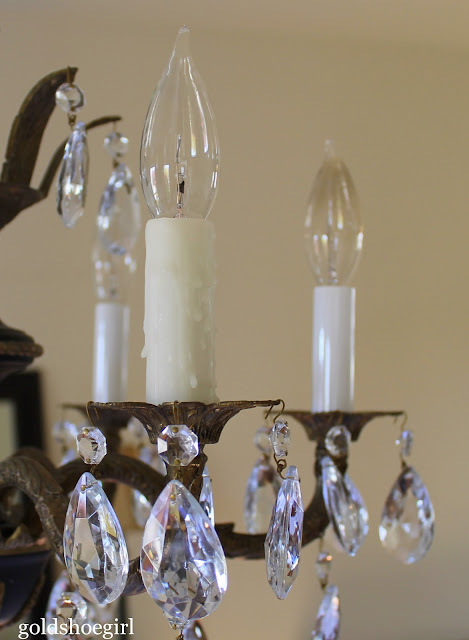 The plain bright white plastic candle covers were just not in keeping with the antique feel of the rest of the chandelier. So like usual I googled it, and I found that I could buy candle covers to improve the ambiance of my chandelier. To top it off they were fairly inexpensive at $3.90 each - granted I needed 5- but compared to the overall cost of the refurbishing it was nothing. 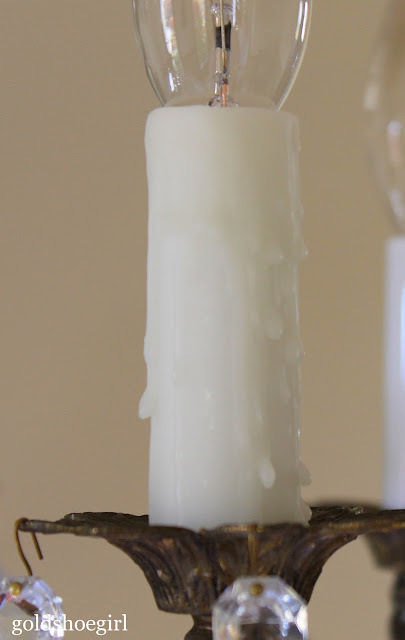 Well, long story short, the candle covers arrived today and I am loving them. Loving them. They are white beeswax candle covers and I bought them from an online store called chandelierparts.com. They have tons of choices from beeswax covers to designer print covers that you can use to spruce up your chandelier. I have seen a lot of chandelier redos out in blogland lately, and I think that new covers like these could be the perfect finishing touch especially if you are going for an antique or country look. Here are some quick pictures of the new candle covers. This first one shows both the new cover in the front versus the old in the background. The drips looks and feel just like a real candle and the off-white color is so much better against the body of the chandelier. 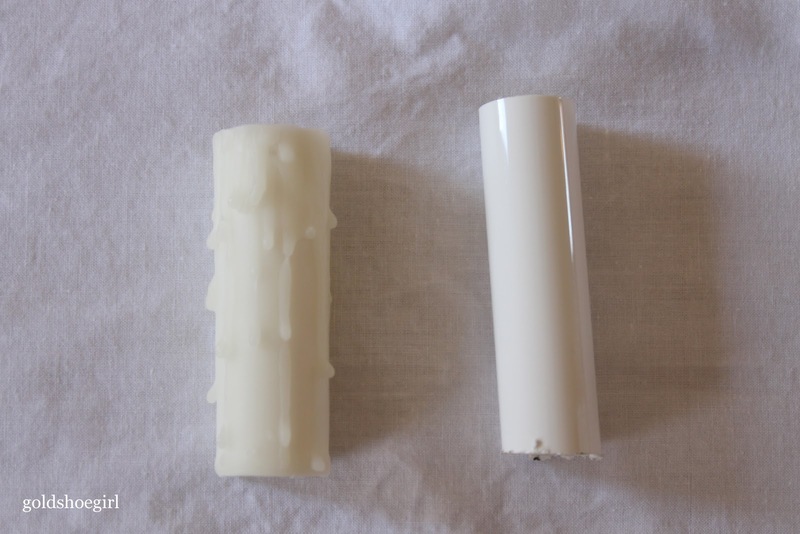 Here you can see the beeswax cover on the left and the plastic one on the right. Pretty dramatic difference. One last close up of the new cover. This picture shows them all installed and with the light on. I love the glow. 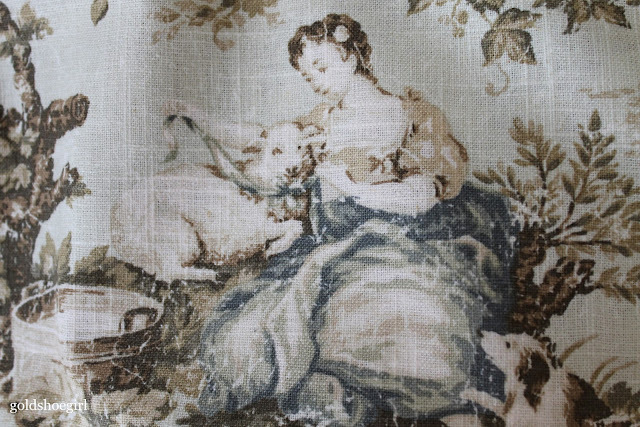 I can't wait to finish the dining room now. The chandelier adds a nice romantic touch to the room. Now lest you all think that all I've done this week is install candle covers here is a sneak peek at the project I have been working on for the last few days. Can you guess where this lovely young lady is going to end up?